Coming to the final days of our European adventure, I had one last chocolate shop on my list to hit up. This particular chocolate shop wasn’t actually on the “Top 10” list that I had used to hit up the other chocolate shops on our trip, but rather this was a local mom & pop, family-run operation in a small tourist city in Belgium that we happened to be visiting. From Brussels, my husband and I hopped on the train for a trip to Bruges, Belgium. 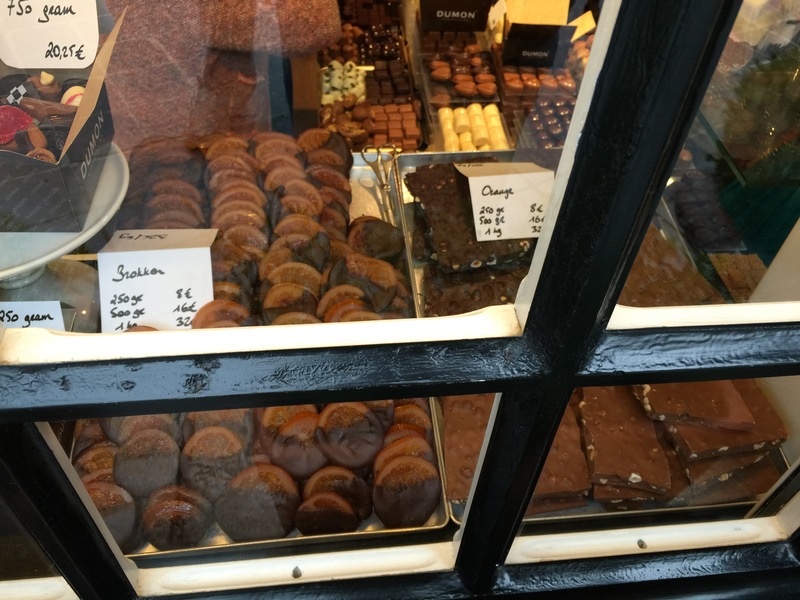 Located in this small touristy city of Bruges is a family-run chocolate shop that was highly recommended by a travel guide that I use frequently. Since I was going to be in this town anyway, how could I turn down some good chocolate? 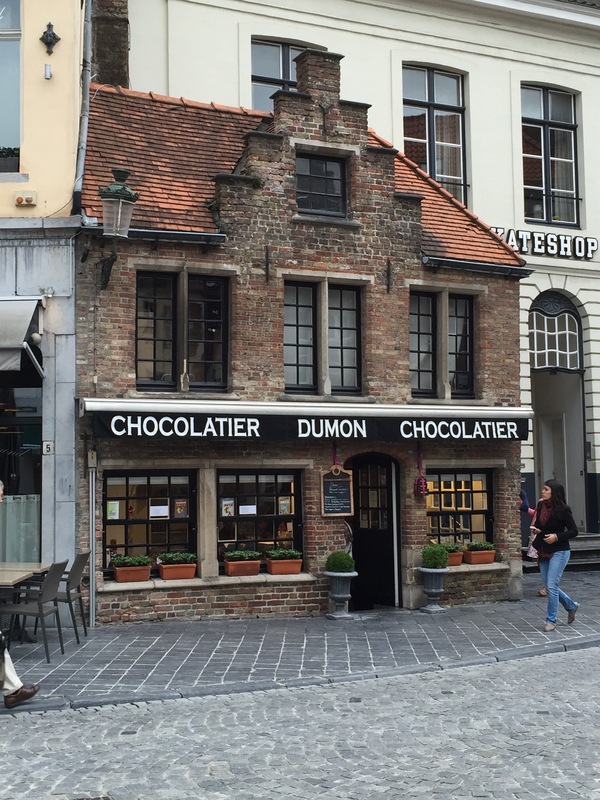 Dumon Chocolatier began in 1992 by Stephan Dumon in a small Belgian city of Torhout, just outside of Bruges. Having studied the art of chocolate making, Stephan started creating artisan truffles for nearby bakeries and pastry chefs. The reputation of his amazing chocolates began to spread, and soon local residents started asking Dumon if they could buy some of these wonderful chocolate truffles from him directly. From this success, Stephan set up a small shop out of his garage. 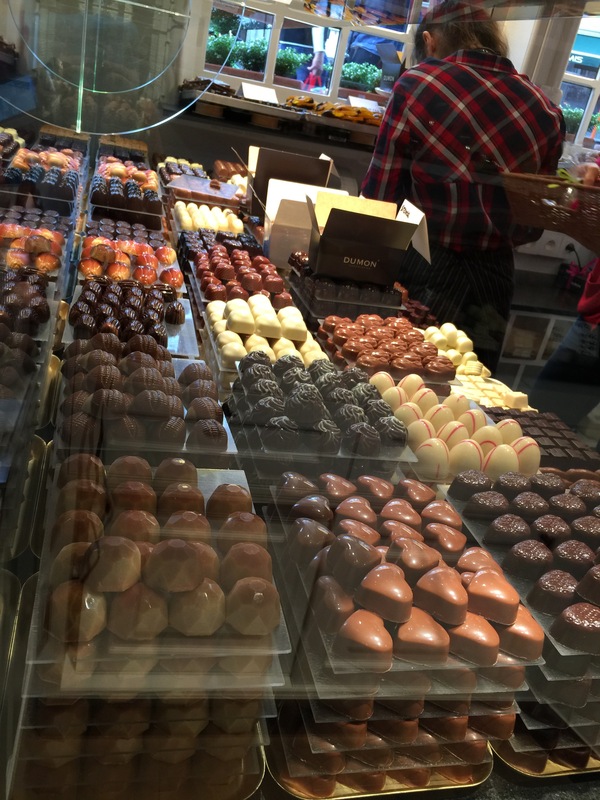 In 1996, Stephan’s mother opened up a shopping Bruges which specialized in medieval architecture and fresh traditional pralines. This shop became a landmark within Bruges and started selling the famous Dumon chocolates. Today, this shop is run by Stephan’s sister. Since those days, Dumon has expanded its operations and opened up other stores, including worldwide locations in Hong Kong and Spain. Located in a small square, the Dumon Chocolatier shop is a small space with a very medieval feel to it. The operation feels very personal, very small scale and family-owned rather than some of the other chocolate shops we’ve been to where it was a very large scale operation. Here at Dumon, it’s all about the chocolate. 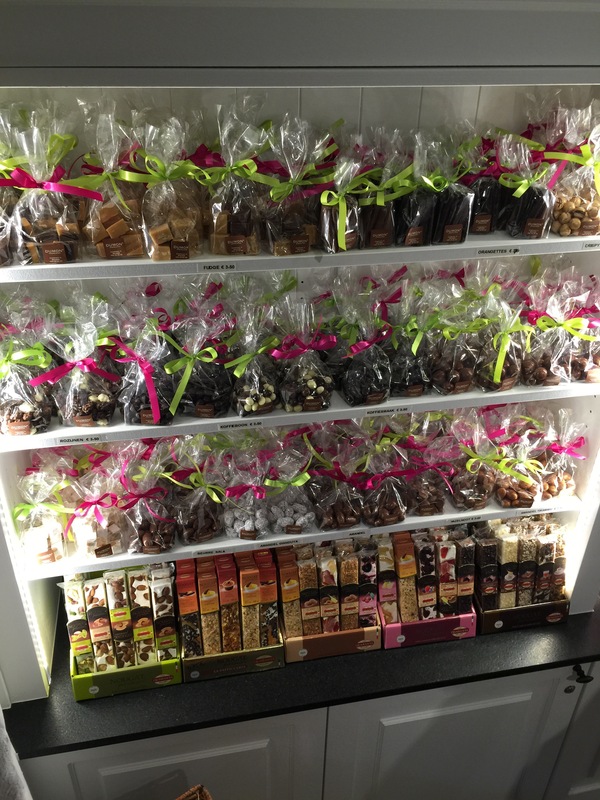 The tiny space is packed wall-to-wall with pre-packed chocolate boxes and gift sets and then trays full of fresh chocolate truffles and pralines and bon bons. When I stepped into the small store, it was crowded with people waiting to get their hands on some of this amazing chocolate, much as I was. As you wait in line, the whole lower half of the store is filled with pre-bagged chocolate goodies featuring some of Dumon’s most famous chocolate creations, such as their chocolate dipped candied fruit slices and their marzipan chocolate creations. As you approach the counter, your senses are bombarded with the rich scent of chocolate candies and your eyes feast upon these beautiful chocolate creations. There are chocolate hearts, and shells and pralines, and candies filled with all sorts of ingredients such as hazelnut and nougat. There was milk chocolate, dark chocolate and white chocolate, truffles filled with nuts or caramels or cremes, marzipan candies and jellies, and the signature chocolate dipped fruit. You don’t even really know where to begin or what to choose from. Like all the other chocolate shops we’ve run into in Europe, everything here at Dumon Chocolatier is sold by the weight. There are three standard size boxes that Dumon sells their individual chocolate pieces in, 250g, 500g or 750g. To those of us in the United States, telling me you’re selling chocolate in weight by grams means nothing to me as I have absolutely no idea how many pieces of chocolate would be in 250g. As I was a bit overwhelmed with the whole idea of trying to put together a box and as I really had no idea what I wanted other than an assortment of their most famous chocolate, the girl behind the counter suggested that I just purchase a pre-made box of chocolates that already came with an assortment of the shops most famous chocolate candies. She assured me that the box was pre-packed just that morning and everything that I would want to choose from their display could be found inside the pre-packed box. That worked for me, so I bought a small box of 250g, which in the end is quite a bit of chocolate, and decided to share the box of chocolates with my husband on the train from Bruges back to Brussels. 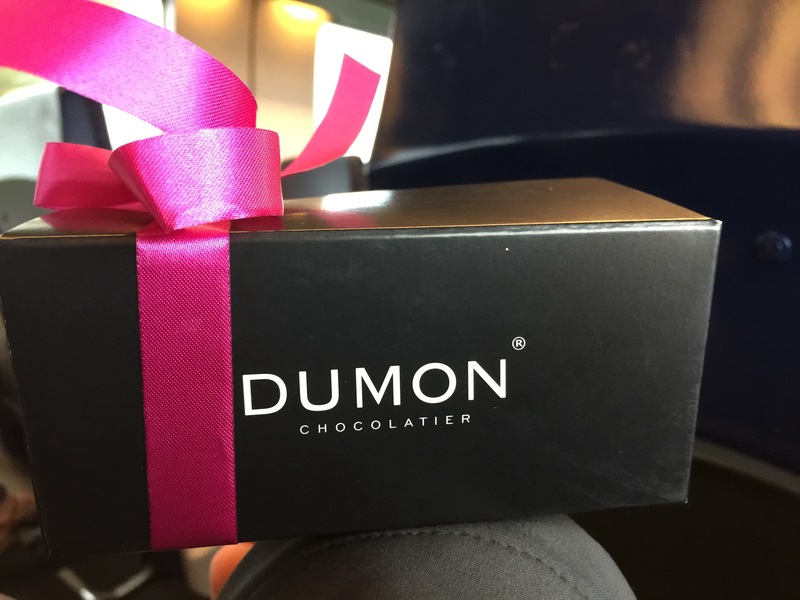 Opening the Dumon Chocolatier box was like opening up a gift box. The treasures held within the box were mouthwatering. 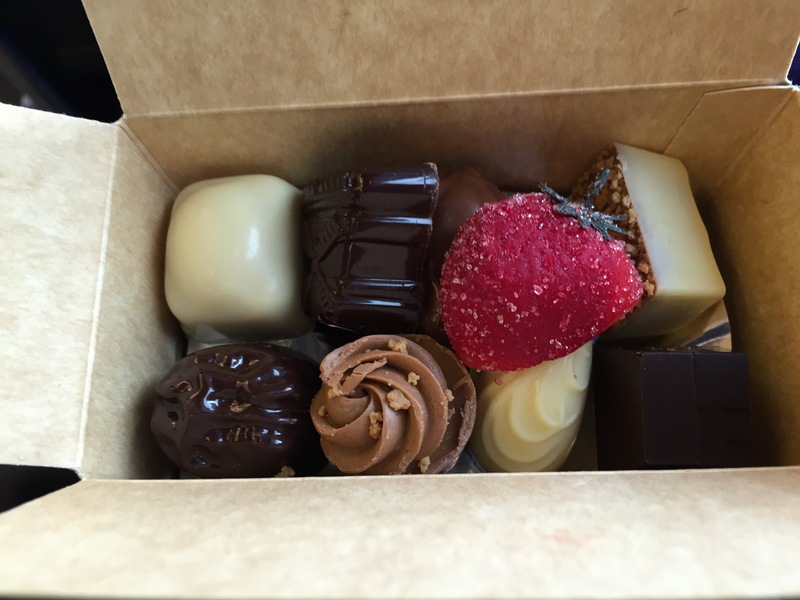 As promised by the clerk in the chocolate shop, the box was indeed filled with two layers of an assortment of different kinds of chocolates. The strawberry marzipan was different and unique, and while I don’t like marzipan generally, tis wasn’t bad at all. The little miniature chocolate mousse cup was fantastic and sweet and light. The various other chocolate bon bons and truffles were all done deliciously – caramel filled, hazelnut filled, white chocolate enrobed, dark chocolate bon bons and everything else in between. 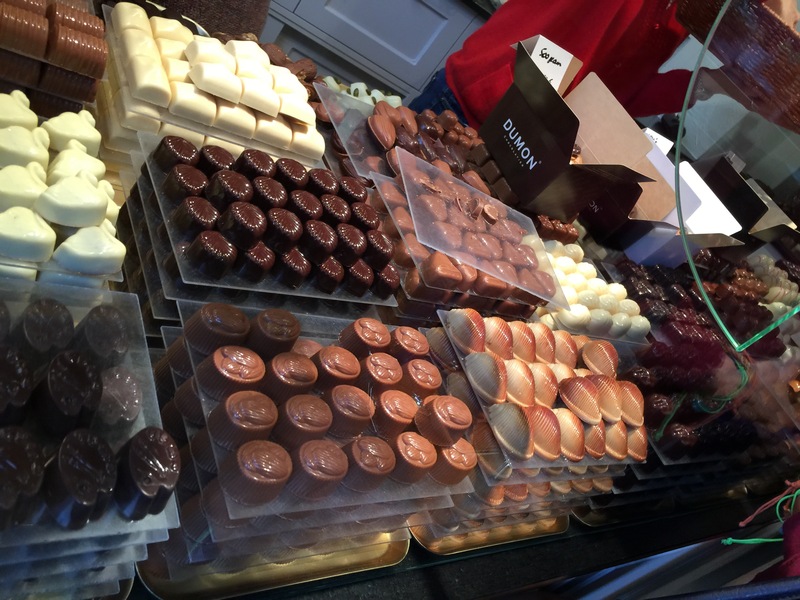 My husband and I agreed that while Dumon Chocolatier wasn’t our favorite chocolate shop on this European adventure, it was actually quite tasty and better than some of the other higher-end shops we visited. Dumon was pretty middle of the road in terms of taste, quality and creativity, but in terms of value, Dumon Chocolatier was number one. Some of the other chocolate shops we visited, while absolutely delicious also put a large dent in the wallet. Dumon Chocolatier was tasty and really quite affordable. You get a lot of chocolate for very few Euros, and in terms of the balance between taste and price, Dumon Chocolatier can’t be beat.